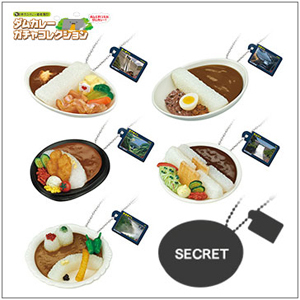 [Japan Water Agency] “Dam Curry and Rice” Gacha is Getting Popular Now! Home > Topics > "Dam Curry and Rice" Gacha is Getting Popular Now! To satisfy culinary interest of dam goers, especially at lunch time, at many of the restaurants/cafeterias located close to the management offices of the dams as well as Road stations near-by, Dam's specialty curry and rice plates are served. To further stimulate the enthusiastic dam visitors, Japanese Toy manufacturer Takara Tomy Arts started selling "Dam Curry and Rice" series of Gacha featuring 6 different kinds of "Dam Curry and Rice" miniature toys at the end of August of this year. All of them resemble the layout of real vegetables, meat, curry and rice placed on the plate. All of them come with the miniature dam cards on which actual names of the dams and key specifications are also printed. Six plates are of Miyagase Dam (Aikawa-machi, Kanagawa Pref. ), Maruyama/Shin Maruyama Dam (Yaotu Town, Gifu Pref. ), Toyohirakyo Dam (Sapporo City, Hokkaido), Shin Toyone Dam (Toyone Village, Aichi Pref.) , Hiyoshi Dam ( Nantan City, Kyoto Pref.) and the one secret Dam. See the photo. "Gacha" is a capsule toy, i.e. a small plastic-made miniaturized model toy put in a capsule shaped piece and is sold through a small vending machine. When you insert a100 yen coin or 3 100 yen coins (depending on each toy value), you will get a capsule. You cannot choose exactly what you want. Out of a certain different selections, you will get one. Gacha vending machines are placed at toy shops, toy corners of shopping plazas, and shopping malls, etc.